The contaminated sub-surface continues to be an important area of environmental concern. This area of research shows increasing maturity from an initial focus on levels of contaminant metals and organics in soils to an examination of the physical and chemical interactions of contaminants with soil and rock minerals; how these interactions control bioaccessibility and may help in contaminant removal/remediation is also of interest. 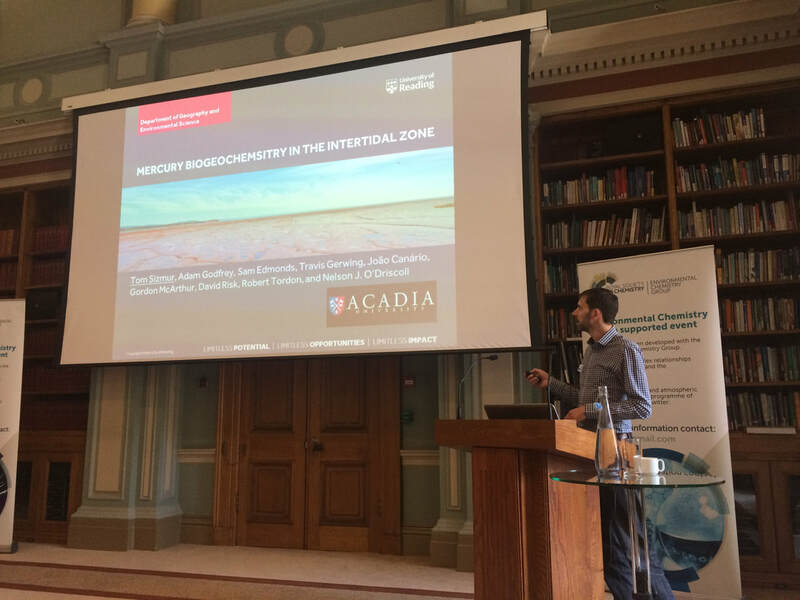 The purpose of this meeting, jointly organised by the RSC’s Environmental Chemistry Group and the Mineralogical Society’s Environmental Mineralogy Group, was to survey recent advances in our understanding of biogeochemical processes affecting contaminants in the soil environment. The first session was primarily concerned with organic contaminants. Two presentations from Newcastle University (Jim Entwistle and Katherine Rothwell) looked at redox systems based upon Fe(II)/Fe(III) couples and clay minerals. Entwistle looked at the formation of electron doped clay minerals which might then be used to degrade trichloroethene and tetrachloroethene. The systems showed little ability to reduce these exemplar chlorinated ethenes, though he was able to identify the formation of a green-rust like phase. Rothwell, on the other hand, showed that the presence of redox mediators could aid in the degradation of exemplar nitro-aromatic compounds. Mohammed Alyami (Bangor University) was interested in the analytical challenges presented by the extraction of crude oil from Saudi Arabian sands. He further examined the challenges to plant growth in oil contaminated media. Ian Ross (Arcadis) was also concerned with analytical and interpretive challenges. In this case, his focus was on perfluoroalkyl substances (PFAS) present in a contaminated land site. He focussed upon the use of advanced analytical tools that could be used to identify a range of PFA molecules. Sul Mulroy (Manchester University) was concerned with the extraction of Co and Ni containing ores from various mines in Africa and their environmental impact. Data show that proximity to extraction locations leads to high exposure rates for human and other biotic receptors. Using Extended X-ray Absorption Fine Structure (EXAFS) spectroscopy he was able to show that Ni and Co were associated with Mn(III/IV) oxides. Furthermore, Ni was located as an inner-sphere complex over hexagonal vacancies in the phyllomanganate layers of lithiophorite, whilst Co typically replaces Mn in lithiophorite phyllomanganate layers. 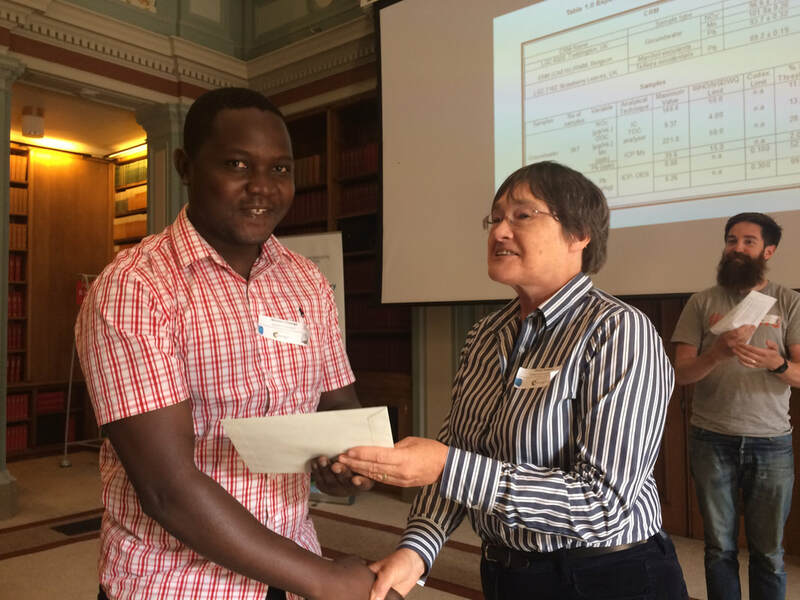 Malama Chisanga (Manchester University) examined the use of Raman Spectroscopy and reverse isotopic labelling to establish whether microorganisms were able to degrade a target contaminant. In this case, Pseudomonas putida and Escherichia coli were grown in 13C enriched glucose and then exposed to 12C enriched phenol. A wavenumber shift in key vibrational bands shows the metabolisation of the target compound by P. putida. Bio-monitoring was the subject of the next presentation from Daniel Niepsch (Manchester Metropolitan University). Using lichens taken from various locations in central Manchester, he examined the take up of N, C and S. Moreover, through the determination of isotopic enrichment factors, he was able to tentatively ascribe elemental uptake from various anthropogenic sources. 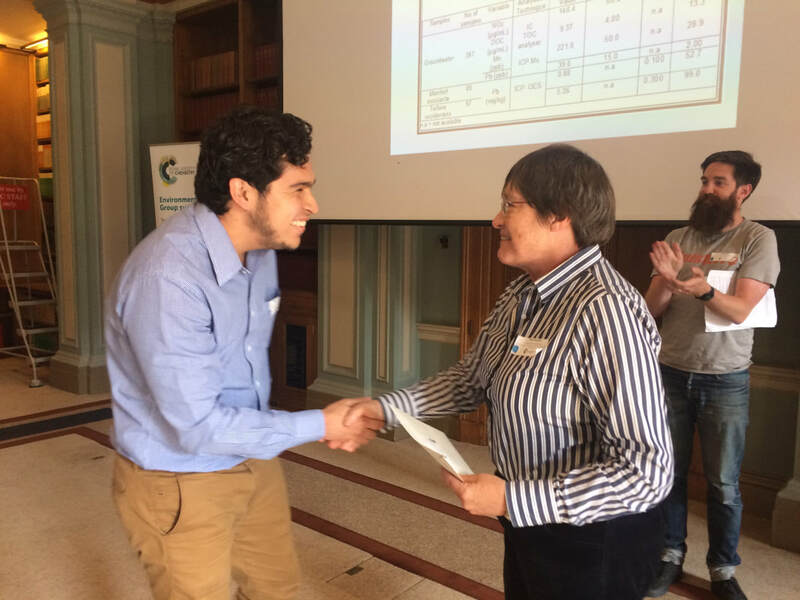 Biological intervention, using fungi to remediate a site contaminated with Pb and PAHs, was the focus of Felipe Sepulveda’s (University of Glasgow) presentation. Culture experiments indicated that Paecilomyces javanicus could grow in the presence of Pb and PAHs. After 10 days of exposure P. javanicus grew around the PAH particles, indicating that they could act as a potential carbon source and reduce the Pb concentration. Sequential extraction, using acid solutions of varying concentration, was used by Joanna Wragg (BGS) to help identify the mineralogical sources of bioaccessible As. The dissolution of a predominantly Fe-As mineral phase and a Ca-Fe-As phase seemed to be responsible for the release of bioaccessible As as measured using a gut model. The keynote lecture was presented by Tom Sizmur (University of Reading and Chair of the ECG). His subject was the biogeochemistry of mercury in the intertidal mudflats in the Bay of Fundy in Nova Scotia, Canada. Low concentrations of mercury in sediments leads to enrichment in in situ invertebrates including polychaete worms and ultimately semipalmated sandpipers. Studies have shown that sandpipers migrating from northern Canada to South America present significantly increased mercury body burdens due to their consumption of large quantities of polychaete worms prior to their migration south. His work demonstrated that the worms could alter the redox conditions of their sediment environment – oxidizing S to SO42- – which had the effect of increasing the bioavailability of Hg. Some extremely interesting and well-made measurements showed that solar radiation and the concomitant rise in temperature could lead to increased rates of Hg reduction to the elemental state and volatilisation of Hg from the sediment environments. The causal risk pathway of hazard-pathway-receptor can be broken by intervention in the pathway process. Two presentations (Ian Ross, Arcadis and Adrian Cleary, University of Manchester) examined the use of phosphates to reduce elemental mobility at contaminated land sites. Ross looked at the addition of soluble phosphate to reduce the mobility of U(VI). Reduction to U(IV) can lead to immobilisation but is potentially reversible. The formation of insoluble and surface passivated U(VI) phosphate can be a more sustainable solution. Cleary focussed upon the use of glycerol phosphate to immobilise the radioactive nuclides 90Sr, 99Tc, and U. The breakup of glycerol phosphate to its glycerol and phosphate moieties provided remedial opportunities for nuclear facilities. It was shown that glycerol, as an electron donor, can immobilise Tc and U through reduction. On the other hand, the presence of phosphate and calcium can lead to Sr mineralisation. Of course P can also be a potential pollutant. Sam Bingham (University of Bristol) examined the role of the Upper Greensand aquifer as a sink and source of phosphate in the Hampshire Avon catchment. Changes in physico-chemical conditions such as changes in pH, Ca2+ and PO43- concentration were shown to impact the precipitation or release of phosphate. Finally, Joseph Nwackukwu examined the impact that urbanisation in SE Nigeria and changing land use had on human exposure to NO3- and Pb.